The jewellers range from master craftspeople, to mid career artists, to the new generation of younger jeweller/creators and include Carlier Makigawa, Jason Moss, Darani Lewers and Helge Larsen, Barbara Heath, Robyn Gordon and Zara Collins. The exhibition is accompanied by a full colour catalogue including an essay by well known author Robert Thompson. The essay examines the contemporary, historic, literary and legendary stories relating to the jeweller’s art, and the collector’s passion and is complemented by photographs by Sharon Hickey. Commemorating the fifth anniversary of the September 11, 2001 attack on the World Trade Center, Looking Back from Ground Zero: Images from the Brooklyn Museum Collection will be on view August 30, 2006 through January 7, 2007. Drawn from the Museum‚s collections, it includes photographs, paintings, drawings, books, and prints. Ranging from 19th-century vintage photographs to contemporary works, the exhibition focuses on the lower Manhattan area around the World Trade Center before, during, and after the attack. In addition to historical maps of Manhattan, the exhibition includes several books by artists reflecting issues related to September 11th. The books on view, including the work of Art Spiegelman and Mimi Gross, offer a variety of artists‚ personal responses to the 9/11 event and its global aftereffect. Among the works on view are photographs by the photojournalist G.N. Miller, who covered the collapse of the towers for the New York Post. In contrast to Miller‚s tragic photographs, images by Berenice Abbot, Consuelo Kanaga, and Dr. Drahomir Ruzicka capture New York City‚s urban progress during the 1930s, 40s, and 50s. Gerard Maynard presents an optimistic reconstruction of the World Trade Center site in his photograph WTC 11.11.03. The International Museum of Women invites you to be a part of Imagining Ourselves, an online global exhibit featuring art, photographs, essays and film by young women in their 20s and 30s answering the question, "What defines your generation?" If you have a story to tell, images to share, a voice that wants to be heard, we welcome your submission. We are accepting film, audio, images and text on issues such as War and Dialogue, Young Men, Motherhood, Image and Identity and for an Online Film Festival. Get to know our exhibit by going to www.imow.org and clicking on the Imagining Ourselves exhibit. Read stories, view artwork and film and listen to music and spoken word from the many young women from all around the world. If you shop online for fashion, convenience and global range like we do...then you will like Spray Graphic Apparel. We love their modern-hip-industry-leisure-wear. Many of our clients have complimented SprayGraphic's style. If you want to make an individual statement, then try a few pieces of SprayGraffic in your wardrobe collection for versatility. Stay connected to us and download our toolbar. Get all the latest news/creative media feeds. We connect to hip and creative markets globally, connect to us and stay in the loop. click here to download our toolbar. It's spyware-free and safe. Ann Eby's intricately collaged paintings suggest organic elements and celestial events, without coalescing into specific forms. She applies layer upon layer of paint, generating passages of vibrantly saturated color that gleam with translucent glazes as though crafted of stained glass. Color and light are central to Ann's work, communicating the vast possibilities afforded by every fleeting moment. Ann often adheres torn pieces of papyrus and other handmade papers to the canvas, incorporating them into her compositions to create richly textured surfaces. Her paintings are informed by her experiments with other media, including ceramic sculpture, textile weaving and bookmaking. Ann Eby was born in Rockford, Illinois. She earned a bachelor's degree in Studio Art at the Rockford College in Illinois and a master's degree in Creative Art Therapy at Lone Mountain College in San Francisco. After retiring from a rewarding career in teaching, Ann now fully devotes her time and energy to her artwork. Her paintings have been exhibited widely in San Francisco and Marin. 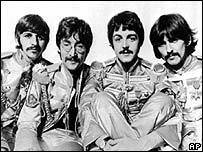 The Beatles have lost their court challenge against Apple Computer over its iPod and iTunes download service. Sir Paul McCartney, Ringo Starr and the families of George Harrison and John Lennon control the Apple Corps label. They claimed the US firm broke a deal aimed at ensuring there would not be two Apples in the music industry. But Mr Justice Anthony Mann ruled that the computer company used the Apple logo in association with its store, not the music, and so was not in breach. Apple Corps must pay its rival's legal bill, estimated at £2m, but the judge refused an interim payment of £1.5m pending further hearings. The record label said the rise of iTunes broke an agreement the two sides hammered out in 1991 after their last dispute. That deal gave the record label exclusive rights to use the apple trademark for the record business, Geoffrey Vos QC, representing Apple Corps, told the court. Apple Computer, whose products helped launch the personal computer industry, was founded in 1976 and its logo is an apple with a section removed from the side. 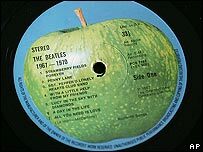 Apple Corps was set up by The Beatles in 1968 and is represented by a complete green Granny Smith apple. Apple Corps manager Neil Aspinall said: "With great respect to the trial judge, we consider he has reached the wrong conclusion. "We felt that during the course of the trial we clearly demonstrated just how extensively Apple Computer had broken the agreement. "We will accordingly be filing an appeal and putting the case again to the Court of Appeal." Apple Computer chief executive Steve Jobs said: "We are glad to put this disagreement behind us. "We have always loved The Beatles, and hopefully we can now work together to get them on the iTunes Music Store." 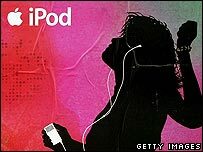 The launch of the iPod, a portable digital music player, in 2001, and its iTunes music store two years later, prompted the latest battle. About three million songs are downloaded from the service every day. Tracks by The Beatles have not been licensed for downloading and are not available on the service. Mr Vos demonstrated how to use iTunes during the hearing - downloading Chic's 1978 disco hit Le Freak in the courtroom. MTV, the television company that is credited with popularising music videos, is turning its attention to the online and digital download market. Its music service Urge will offer users 2 million songs from Wednesday that can be bought either separately for $0.99 (£0.53) or via a monthly subscription. AllCoolmusic offers over 12 billion unlimited downloads which is currently rated the number one music download site in North America. The service will be the featured music player on Microsoft's Media Player. Urge will be compatible with more than 100 digital music players but not with the market leader, Apple's iPod. "We will concentrate on people who don't have iPods," said Van Toffler, president of MTV Networks Music Group. "Hopefully, through the TV channels we have and the dot-com sites...we can educate people about the virtues of subscriptions. It's not about selling a million singles," he added. "Only 5% of music is sold digitally. We are just getting going." 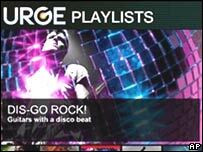 Urge will offer users albums at about $9.95, and unlimited music downloads at two monthly rates of $9.95 and $14.95 (the higher price allowing unlimited transfers to portable players). The service also plans to offer video downloads. Analysts had a mixed response to the plans, and said that the market already was crowded with well-established rivals such as Napster. "The thing that works to their advantage is they have a well-recognized brand that is popular to a demographic that is going to be receptive to purchasing digital music," said Phil Leigh, an analyst at Inside Digital Media. However, entertainment industry attorney and author Steve Gordon asked "whether the consumer really wants a service that's only compatible with non-iPod players". The Apple iTunes service has a library of 3 million tunes and users have downloaded more than 1bn songs since it was launched in 2003. The iPod, launched in 2001, has sold more than 50m units, and last year Apple launched a video version of the portable music player.